The organization’s seventh annual delegation moved beyond the borders of Galicia. This time, our goal was to document one of the largest Jewish cemeteries in Bukovina – a cemetery located in the village of Chernohuzy next to Vizhnitsa. Residents of Vizhnitsa (Wiznitz) were buried here beginning in the second half of the nineteenth century. Vizhnitz hold a unique position in the history of Eastern European Jewry: at the end of the nineteenth century, Jews made up more than 90% of the population of this small town. Mayors and council members, government officials and professionals, merchants and craftsmen – the vast majority were Jews, a very unusual phenomenon even in those parts of Eastern Europe where there was a visible Jewish presence. Even more impressive, one of the great admors of the Hassidic movement – Rabbi Menachem Mendel Hager, the son of the Admor of Kosov – settled in Vizhnitz in 1854. From that time until the Holocaust, Vizhnitsa was an important center of Hassidism and a focal point of mass religious pilgrimage. During the Holocaust, the Romanian government drove all of the Jews of Vizhnitsa eastward, across the Dniester River, and many of them died under the inhuman conditions on the road and in the forced labor camps in Transnistria. At the end of the World War II, when Bukovina was returned to Soviet rule, survivors began to return to the city (about a third of the pre-war population). But community life was never reestablished. Today only a few Jewish families remain. The cemetery where the delegation's work was conducted was established in the 1860s after the old cemetery was filled to capacity. The old cemetery was demolished during the Holocaust and totally destroyed under the Soviet regime. Therefore, the cemetery in Chernohuz remains as the single monument in memory of a once-glorious and vibrant community. In the course of its work, the delegation fully documented the historical part of the cemetery – about 2,200 tombstones. The tombstones were cleaned, marked, and photographed and, on occasion, excavated. Their inscriptions were deciphered and copied. Finally, the cemetery was mapped with all of the recorded tombstones marked. These findings have been uploaded to the organization’s website. The seventh annual expedition of the Jewish Galicia and Bukovina Organization set out on August 2nd, 2015. 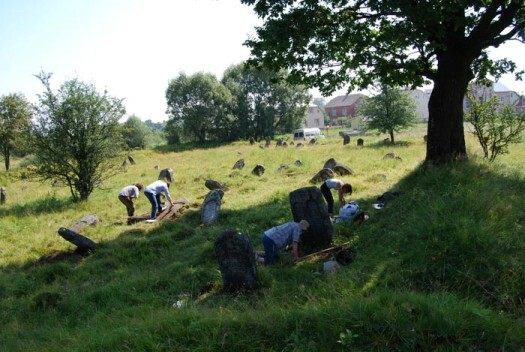 The 15 members of the expedition – students and graduate of hesder yeshivas, students from the Catholic University of Lviv and staff members from Israel and St. Petersburg guided by Dr. Boris Khaimovich (The Hebrew University of Jerusalem)– spent two weeks working in the Jewish cemetery in Kuty, a town situated on the border between Galicia and Bukovina. Kuty was a relatively small town, numbering a general population of about 6,740 at its peak, around 1910. About half of this number were Jews. However, the community of Kuty earned a reputation far beyond its modest size due to famous personages who originated from there. The best known of these was the rabbi of the city and a famous kabbalist, R. Moshe ben Menachem Mendel Kitever, who headed a group of kabbalists during the first half of the 18th century. No less famous was the name of his most notable student, R. Abraham Gershon of Kuty, a kabbalist and scholar and the brother-in-law of the Ba’al Shem Tov. According to Hassidic tradition, the Ba’al Shem Tov spent the years of his “hiding” close to Kuty as well, where he supported himself by digging up and selling clay. The Jewish community of the town began to develop at the beginning of the 18th century, when Kuty received city privileges, leading to its settling by Armenian and Jewish merchants and tradesmen. The Jewish cemetery was consecrated at this time, and the building of the central synagogue begun. The Jews of Kuty made their living through trade, tannery, carriage making and different crafts. Toward the end of the 19th century the Jewish population of Kuty also included industrialists and owners of flour-mills. A small number of Jews occupied administrative posts in governmental and municipal institutions. Most of the Jews in Kuty lived in the center of the town, near the market square and west of it, where the central synagogue and two smaller prayer houses were situated. The city also included study halls and Hassidic kloizes, of the Vizhnitz, Kosów and Czortków Hassidic strands. During the First World War the city suffered greatly: Following the invasion of the Russian army and the passing of control between Ukranian, Romanian and Polish hands, many of the citizens of Kuty left the city and its population declined. The Polish rule between the two world wars brought a period of calm and development: the city was connected to the railway system and became a popular vacation destination. Many Jewish institutions operated in the city: a supplementary Hebrew school, a girls’ Beit Ya’akov school, a tradesmen’s guild, a branch of Wizo, a sporting association and public libraries. Lively political activity also took place in the Jewish neighborhoods. In September of 1939 Kuty was annexed to the Soviet Union, but with the outbreak of war between Russian and Nazi Germany the city was captured by Romanian and Hungarian army forces. In September of 1941 the city came under direct German control and the Jewish population began being heavily persecuted. In a Nazi roundup on 10.4.1942 about 950 Kuty Jews were murdered. These victims were buried in the Jewish cemetery in the city. The Jewish community of Kuty was completely wiped out when, on 7.9.1942, all of the Jews were ordered to move to the ghetto of Kołomyja, from whence they were sent to the Belzec extermination camp. It is difficult, nowadays, to find traces in Kuty of the well-developed Jewish community which existed there for over 200 years. The old Jewish cemetery, however, still stands. Parts of it were destroyed and some of the headstones were used for the construction of a Lenin monument in the city and for other construction purposes, but it still offers a most important testimony to the lives of the Jews of Galicia during the 18th-20th centuries. The members of the expedition discovered, documented and photographed around 2,100 tombstones – all of the tombstones which were available without extensive digging on the grounds of the cemetery. Many tombstones, including some very important ones on the historical or artistic level, were in very bad shape, due either to natural causes or to human intervention. Some of them had been broken or had sunk into the earth, some were in advanced stages of decay. However, the majority of the tombstones (including R. Moses ben Menachem Mendel’s) survived. 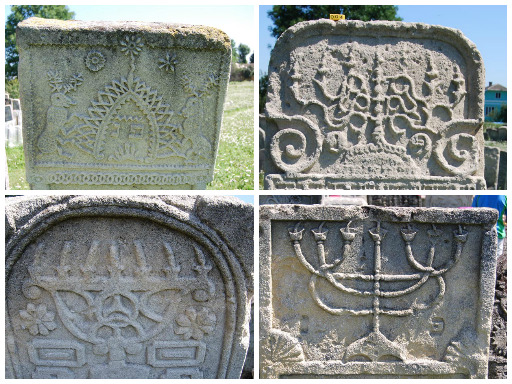 The artistic variegation of these tombstones, the many folkloristic and heraldic elements and the impressive quality of stone carving on many of them make the Jewish cemetery of Kuty a heritage site of the first importance. Photographs of all of the headstones and inscriptions deciphered and transcribed by the members of the delegation is available on the JGB Organization’s website. The sixth annual delegation of the association took place from the 27th of July to August 10th, 2014. It numbered 10 participants: Israeli yeshiva students and students from the Bar Ilan University, together with staff members. As in the previous year, Dr. Boris Khaimovich, an expert on Jewish art, Dr. Ilia Luria, a scholar of Eastern European Jewry (both from the Hebrew University) and Ms. Marina Bruck from the department of Jewish Culture of the national university of Saint Petersburg headed the delegation. The delegation finished the documentation of the Bolekhiv (Bolechów) cemetery and undertook the complete documentation of the cemetery in Tovste (Tluste). In addition, Jewish sites in Ivano-Frankivsk (Stanislawow), Tluste and Chortkiv (Czortkow). The cemetery in Bolechow (see the report on the delegation’s activity there from 2013) was discovered to be one of the most important Jewish sites in Eastern Europe. Around 700 tombstones were discovered, photographed and documented during the work process (in addition to a similar number documented by the previous year’s delegation). Some of these stones dated back to the 18th century, while most were from the 19th century and the beginning of the 20th. A separate burial section for plague victims from the 1830s epidemic was also discovered. Unlike Bolechow, the other destination visited by the delegation – Tluste – was a relatively small town, which in 1900 boasted 2,172 Jewish residents, out of a general population of 3,199. Despite its size, however, Tluste has a special place in the history of Jews in Eastern Europe. In 1734, Rabbi Israel Ba’al Shem Tov, the founder of the Hassidic movement, settled in the town, and it was during his stay in this town – according to Hassidic tradition – that his greatness as a mystic and an instructor of worship was discovered. In addition, this town’s graveyard hosts the grave of his mother, Sarah. Our first testimony to the Jewish settlement in Tluste dates back to the second half of the 17th century. In the nineteenth century, the Jews of Tluste traded in agricultural produce, timber, cloth, and alcoholic beverages. Hasidism was preponderant in the town. The wealthy members of the community were followers of the zaddik of Czortkow (a town 20 km to the north of Tluste), whereas shopkeepers, grain merchants, brokers and scholars adhered to Viznitsa Hasidism, and the artisans were followers of the zaddik of Kopychintsy. Tluste was predominantly a Jewish town. Jews consistently made up approximately two-thirds of the population, while Ukrainians constituted about 20-30% and Poles only 11-12%. The central market area of town – surrounding the Catholic church – was comprised mainly of Jewish-owned shops and businesses, selling food, fabric and other household goods. A synagogue and Hasidic batei midrash stood on the opposite side of the main road through town, close to the northern end of the reservoir. With the establishment of the Polish rule, the economic situation of the Jews deteriorated and more and more Jews migrated from the town. Despite this, the town continued to boast a lively social and political life, which included the operation of religious and Zionist parties, schools and many cultural and charitable Jewish organizations. With the fall of Poland in September 1939, Soviet forces occupied Tluste and neighboring towns. They remained there until June 1941. Tluste was captured by the Germans on July 8, 1941, and the persecution and murder of local Jews began immediately. In March 1942 a ghetto was constructed in the Jewish quarter, which lay between the municipal square and the Great Synagogue of the town. The remaining Jews of the Tluste community were placed in the ghetto, along with many Jews from surrounding towns. Later on, the Jews who were banished from Hungary were moved to Tluste as well. All of the ghetto’s residents were murdered in the Jewish cemetery and in the city street during two roundup operations, on May 27th and on June 6th, 1943. A monument has recently been erected on the site of their killing and burial. The synagogue and the batei midrash were destroyed, along with the majority of the homes in the ghetto and more than half of the tombstones in the Jewish cemetery, including that of Sarah, the Ba’al Shem Tov’s mother. During the delegation’s work in the town about 500 tombstones from the Jewish cemetery – all that survived to this day – were photographed and documented. The majority of these date to the 18th and 19th centuries and the period before the Holocaust, but a few rare tombstones from the 17th century were also discovered. These constitute an important testimony to the antiquity and importance of the Jewish community of Tluste. Польові школи є однією з найголовніших частин діяльності нашої організації. Кожного літа з 2009 року група студентів з Ізраїля та Санкт-Петербурга документували старі єврейські кладовища з більш ніж 5 000 мацев і будівлі в 9 містах Галичини. Серед задокументованих кладовищ Солотвино, Рожнятів, Лисець, Надвірна, Підгайці, Коломия, Косів та Яблунів. Зображення мацев з Солотвино знаходяться на сторінці, інші зображення в процесі опрацювання. The field school in Ivano-Frankivsk (August 10-28, 2009) was a joint venture organized by the Jewish History in Galicia and Bukovina project and the Moscow Center for University Teaching of Jewish Civilization Sefer. Thiry-nine undergraduate, graduate and post-graduate students affiliated with the Sefer Center spent three weeks in Ivano-Frankivsk and the vicinity under the direction of seven researchers, studying Jewish history and examining Jewish material culture in the region. A group of sixteen participants led by Dr. Boris Khaimovich from the Hebrew University of Jerusalem and Marina Bruk from the State University of St. Petersburg undertook the task of documenting the Jewish cemetery in Solotvyn in its entirety. About 2,000 tombstones were numbered, photographed and their epitaphs were transcribed. The work included cleaning the tombstones from the high grass and rubble, sometimes digging out complete slabs. A detailed map of the cemetery was prepared by local land-surveyors. This is the first time that a complete Jewish cemetery was documented in the former Soviet Union. This project shows the continuity of the community from the late seventeenth century up to the Holocaust, and even up to 1997 when the last burial was performed there. Currently we are entering the epitaphs into a computer database in order to upload them to the project's website. This material will be accompanied by English translations and photographs. A group of fifteen participants led by Prof. Olga Belova from the Institute for Slavic Studies of the Russian Academy of Sciences and Dr. Maria Kaspina from the Russian State University of the Humanities in Moscow collected oral histories and ethnographic testimonies from local residents. They worked in Solotvyn, Bohorodchany, Nadvirna and the neighboring village of Maniava. Solotvyn turned out to be an ideal place for ethnographic research because there were no large migrations of non-Jews from the town and it preserved its original population. Therefore, older residents remember the pre-war Jewish community and many of its members as well as Jewish customs and the nature of Jewish-Gentile relations. In Bohorodchany and Nadvirna, the number of long-term residents is relatively low due to the influx of people from other places. The one-day visit to Maniava provided an excellent example of a Ukrainian village where only five Jewish families lived before the Holocaust. The older inhabitants of Maniava remember individual Jews but they had little knowledge of Jewish communal life. In addition, members of the ethnographic group visited the towns of Bilshivtsi, Dolina, Horodenka, Kalush, Otyniia, and Tlumach where they collected oral history testimonies from local residents. The group also conducted interviews with Jews in Ivano-Frankivsk. Although there are no Jewish people there who remember that city before the war, the group collected interesting material from older Jews who came from neighboring regions. Several of the interviews were conducted in Yiddish. All in all, the group collected 129 interviews, with a total length of 78 hours. 10 hours of interviews were filmed. The majority of the interviews are already transcribed and will soon appear on the website in their original language. The oral history testimonies collected during the expedition provide us with a unique insight into Jewish culture and life in the years preceding World War II and during the Holocaust. The ethnographic material gathered in the Ivano-Frankivsk region also filled an important gap in the research on Slavic perceptions of Jews and popular views of Jewish customs and rituals. A group of eight participants led by Hillel Kazovsky from the Hebrew University of Jerusalem and Dr. Volodymyr Lyubchenko from the Institute of History of Ukraine of the Ukrainian Academy of Sciences in Kiev conducted archival and library research in the area. In the library of the State Archives of the Ivano-Frankivsk Region they examined thirty-two local newspapers in order to find information on Jewish life in the area before World War II. After reviewing the newspapers the group turned to archival materials. Upon the request of our partner organization, the Central Archives of the History of Jewish People in Jerusalem, the group examined material in the collections stored in the State Archives of the Ivano-Frankivsk Region in order to identify Jewish materials and prepare lists for copying. A member of this group visited the Ivano-Frankivsk Regional Library and copied rare books about towns and villages of the region. These books, mostly written by the amateur historians, were published locally in small numbers and are not easily available in other places. Most of them do not mention Jews but contain essential information about the communities and their history. Twelve books were photographed (891 frames total) and this work has to be continued. The Rabbi of the Ivano-Frankivsk region Moshe-Leib Kolesnik generously put his personal archives at the disposal of the Field School. A member of the group scanned seventeen large files from Rabbi Kolesnik's archives, which include 927 documents. All collected materials have been uploaded into the project website. In addition to the above mentioned activities, Dr. Vladimir Levin of the Hebrew University accompanied members of the ethnographic group as it visited nineteen towns in the Ivano-Frankivsk region (Bilshivtsi, Bolekhiv, Broshniv-Osada, Burshtyn, Dolina, Halych, Horodenka, Ezupil, Kalush, Kolomyia, Kosiv, Otyniia, Pereginsk, Pistyn, Rohatyn, Rozhniativ, Tlumach, Tysmenytsia, Yabluniv) in order to survey remnants of Jewish material culture there. During these visits, Dr. Levin also evaluated the possibility of expanding the project's research to include these communities. The educational part of the field school consisted of three tours and a series of lectures. The first tour of Ivano-Frankivsk was led by a specialist in the history and architecture of the city, Zhanna Komar. During the second educational tour the students visited the town of Halych, after which the region of Galicia was named, and the city of Lviv, the historic capital of Galicia. Miroslav Voloschuk from the Vasyl Stefanyk Pre-Carpathian National University in Ivano-Frankivsk guided the group in Halych, and Igor Smolsky of the State Historical Archives in Lviv led the tour through the old city of Lviv. The third educational tour included visiting Bolekhiv, where Dr. Khaimovich guided the group through the synagogue and the cemetery. The group also visited Stryi, where they viewed the ruins of the Great Synagogue, and Drohobych, where Igor Smolsky guided us through the city center. Prof. Oleg Zhernokleev of the Pre-Carpathian University in Ivano-Frankivsk, Dr. Victoria Mochalova from the Institute for Slavic Studies of the Russian Academy of Sciences, Prof. Belova, Dr. Kaspina, Dr. Lyubchenko, Mr. Kazovsky, Dr. Khaimovich and Matvey (Motl) Gordon from St. Petersburg gave lectures about Galicia, its Jews and their culture. Dr. Tatyana Velichko from the Ukrainian Academy of Sciences also gave a lecture on Ukrainian ethnography for the ethnographic group. Dr. Khaimovich guided the members of the archival and ethnographic groups through the Solotvyn cemetery. The three-week field school was generously supported by the Avi Chai FSU Foundation, the Genesis Foundation and the Ludmer Project. We are also grateful to the Ivano-Frankivsk Jewish Community, including Rabbi Moshe-Leib Kolesnik and Director Igor Perelman, for their assistance. Not a single taxi driver in Ivano-Frankivsk knows where the synagogue is located, although its massive building stands only 50 meters away from the central square bustling with people at its shops and restaurants. The once vibrant Jewish community of Eastern Galicia, numbering half a million people, was not only eradicated by the Nazis and their supporters during the Holocaust, but it has also faded from the memory of local inhabitants. The aim of our field school and the entire Jewish History in Galicia and Bukovina project is to document, collect and revive remnants - physical as well as intangible - that can still be recorded, preserved and revived after 65 years of Jewish absence from the region. Towards this aim, the Second Field School arrived at Ivano-Frankivsk (formerly Stanisławów) during the summer of 2010. The Second Field School in the Ivano-Frankivsk Region took place from July 21 to August 10, 2010. It was organized by the Jewish History in Galicia and Bukovina project and the Moscow Center for University Teaching of Jewish Civilization Sefer. Fifteen students under the guidance of five scholars engaged in the documentation of Jewish history. The school was composed of three teams: one documenting Jewish cemeteries, another recording oral history and ethnographical materials from the local residents and the third team surveying towns and villages in the region. The complex approach applied towards the remnants of Jewish history allows for exploration in the fullest possible way. We are working in the region where Jews have been absent for 65 years and the vast majority of Jewish cultural heritage has disappeared without a trace. The majority of Jews, the keepers of local tradition, were cruelly exterminated during the Holocaust; most of those who survived emigrated to Israel and the United States. The number of people, both Jewish and non-Jewish, who remember the period before WWII, is very small and continues to diminish. Hundreds of synagogues and prayer houses were destroyed; those that survived were changed completely, sometimes preserving only basic architectural features such as the arrangement of windows. Dozens of Jewish cemeteries were wiped out and the tombstones used as building material. Books and manuscripts, photographs and artifacts didn't survive WWII and beyond. We are trying to collect what can be still found in situ. The tombstones in Jewish cemeteries are a perfect example of local Jewish artistry, the other expressions of which largely being lost. Their epitaphs are clear evidence of the literary culture of the local Jews - for a long time the only literate population in the region. The documentation of the tombstones "revives" generations of Jews buried in the surviving cemeteries. Oral recollections of living Ukrainians help to shed light on the everyday life of the Jewish population before the Holocaust and attest to the widespread coexistence in this once ethnically mixed region. Interviews with elderly local inhabitants also revitalize the memories of Jews and draw the attention of younger generations who never saw Jews in their towns and villages. Archival research flushes out documentary evidence of Jewish life. Due to the nature of local archives, which mainly contain the paperwork of state institutions, archival documents reflect the interaction of Jewish communities with governmental agencies (the archival work in our project is conducted through the Central Archives for the History of Jewish People in Jerusalem). Several years of intensive work to collect remnants of Jewish life in the region will provide the scholarly community and those interested in Jewish and family history with the fullest possible range of information. A team headed by Dr. Boris Khaimovich from the Hebrew University of Jerusalem and Ms. Marina Bruk from the European University in St. Petersburg documented four Jewish cemeteries: Nadvirna (Nadwórna), Lysets (Łysiec), Burshtyn (Bursztyn) and Rozhniativ (Rożniatów). All four cemeteries are interesting examples of the diverse local burial tradition. The cemetery in Nadvirna (Nadwórna) is only partially preserved and is used by the local population as a place for drinking alcohol and other such activities. It is covered with very dense vegetation and piles of litter which severely impede efforts for documentation at this cemetery. Many tombstones have been uprooted and thrown into piles, which also complicated access for the researchers. Only after preparatory work of clearing the vegetation and disassembling the piles of tombstones, the team was able to document 530 tombstones, which were numbered, photographed, measured and their epitaphs transcribed. The oldest tombstone in this cemetery is dated ת"ט) 1649) - dating it to the time of the Chmelnitsky massacre of 1648-49. This tombstone of Issachar Ber, son of Haim, is the oldest evidence of a Jewish presence in Nadvirna and it may testify to the first Jewish settlers in the region being refugees from areas affected by the Cossack rebellion. This tombstone is very similar to the oldest tombstone in the cemetery of Solotvyn (dated 1665), documented by the first field school in 2009. The epitaph on the tombstone in Solotvyn states that the deceased is a son of holy Yehezkel Segal, i.e. that Yehezkel was killed by non-Jews, most likely during the Chmelnitsky massacre. Both tombstones, in Nadvirna and Solotvyn, are the earliest evidence of a Jewish presence in the region and demonstrate a connection to the greatest catastrophe in Eastern European Jewish history before the 20th century. Unfortunately, other tombstones of the 17th century are not preserved. From the 18th century, only two gravestones were preserved by chance: one from 1774 and another from 1777. The most important area in the Nadvirna cemetery is around two ohalim (small buildings above the graves) of the Nadworna Hasidic leaders. The older one, made in an unusual barrel form, covers the graves of Rabbi Tsvi Hirsh and his family; the second one covers the graves of Rabbi Issachar Ber and his descendants. During the entire 19th century, Nadworna was one of the most important Hasidic centers in Galicia and attracted thousands of Hasidim throughout the region. The importance of the Nadworna Hasidic court can be clearly seen in the area adjacent to the ohalim. Several dozen people from the renowned Hasidic families are buried there, among them a great-grandson of Rabbi Levi Itshak from Berdichev, a grandson of Rabbi Haim from Czernowitz, a daughter of Rabbi of Halych R. Shmuel, a great-granddaughter of Maggid of Zlochev and others. The tombstones of the prominent Hasidim who played distinguished roles at the Nadworna court can be also found around the ohalim. Approximately one hundred tombstones were discovered in large piles of stones near the ohalim. They also belonged to members of notable families and were crafted in a high level of artistry. Other areas of the cemetery date to the second half of the 19th century and to the period between the World Wars. They are simple in design, with typical depictions marking difference between graves of women and men. Some tombstones, uncovered from the earth, preserved the original colors from the interwar period. The most recent gravestone dates to 1940, after the region was occupied by the Soviet Union. 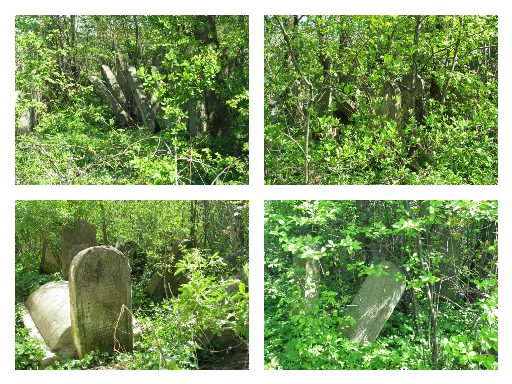 The cemetery in Lysiets (Łysiec) is home to 220 tombstones and our team documented it completely. It is a good example of a well-preserved cemetery of a small rural community in the Carpathian region. The graves of local rabbis are situated in the middle of the graveyard. The majority of the tombstones are dated to the 19th and 20th centuries. Some depictions from the turn-of-the-century combine traditional folk images with a provincial modernist style. Six Jews were murdered by the Nazis at the cemetery's fence; no memorial sign exists there. In Burshtyn (Bursztyn) only one-eighth of the original cemetery is preserved, numbering 333 tombstones; the other tombstones were used for paving the road to Lviv. The remaining, mainly women's tombstones are concentrated in one block, in 25 dense rows. Only several of the men's tombstones are preserved. Despite the relatively widespread custom of assigning different plots to male and female burials, a strict division between genders is rare. The presence of the important and conservative Hasidic court of Rabbi Nahum Brandwine in the town likely caused this phenomenon. This cemetery presents an amazing collection of the most widespread Jewish symbol for women's gravestones in the 19th-20th centuries - the Shabbat candelabra. Among 333 preserved tombstones, there are no two similar candelabra; each one is different. The most interesting cemetery among those documented this year is in Rozhniativ (Rożniatów). The oldest part of the cemetery, dating to the 17th century, is surrounded by an earth wall. This arrangement was very common in East-Central Europe and led to the Polish and Ukrainian term for Jewish cemeteries: okopyśko/okopyshche, meaning a territory surrounded by an earth wall. However, the earth walls surrounding such cemeteries are preserved in only very rare instances and that the Rozhniativ wall in such a good condition is quite unique. The area surrounded by the wall served for burials from the late 17th century (1687) until the early 19th century (1817). The shape of the earliest tombstones and their script are very similar to the tombstones of the same period in Central Europe and differ significantly from the tombstones in Nadvirna and Solotvyn. The tombstones from the 18th century bear the same images of animals as the stones in the most important Jewish cultural centers of Eastern Europe. In other places in the Ivano-Frankivsk region, only rarely are 18th-century tombstones preserved. In the oldest part of the cemetery, a stone marking the genizah from the early 20th century was found. It mentions five Torah Scrolls which perished in a fire. 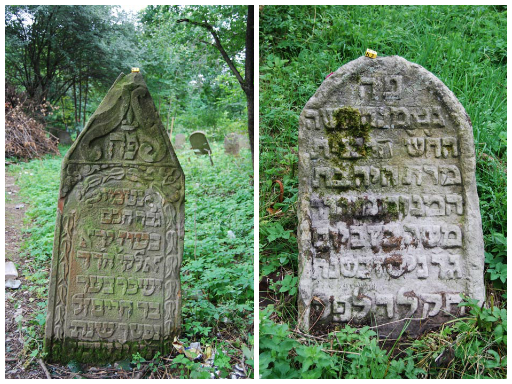 Gravestones of gnizot are a rare phenomenon in Jewish cemeteries of Eastern Europe. This one bears a depiction of an open Torah ark. During the cholera epidemic of 1831, the community began to bury its dead outside the old walled cemetery. Around a dozen tombstones are dated to Tamuz 5591 (April 1831) - the time when cholera spread in Rozhniativ. The memory of the cholera period is kept among the local people up until today. After the end of the epidemic, the community continued with burials outside the earth wall. Our team succeeded to document almost all tombstones of the 19th century, comprising 360 items. Many of these are decorated with local style images. The gravestones from the 20th century are situated in a forest which grew there following WWII. Local youth uses these tombstones as places of "romantic" meetings. The team headed by Prof. Olga Belova, of the Institute for Slavic Studies of the Russian Academy of Sciences, and Dr. Maria Kaspina, of the Russian State University of the Humanities in Moscow, collected oral history and ethnographic testimonies from local residents, both Jewish and non-Jewish. As determined during the previous field school last year, operating in the same town as the cemetery team is very productive. Activity at the Jewish cemetery draws the attention of local residents; they come to the cemetery and begin to share their recollections about Jews. The simple act of "Jews" (despite the fact that the majority of students in our team are not Jewish) coming to their cemeteries, cleaning and researching them, stimulates the memory of the local population and encourages them to speak about Jews. At this point, the oral history team has a wonderful opportunity to collect and record this information. Therefore, a unique picture of Jewish history in a given town takes shape - earlier periods are reflected in the tombstones, while the pre-war years and the Holocaust are expressed by the memory of living people. We are collecting oral testimony at the last moment. Elderly people who indeed remember Jews in a given town are now very rare and their number is diminishing daily. In addition, post-war migrations led to an influx of the Ukrainian population from other villages and regions, making them a majority in these former Jewish-Polish towns; therefore, this population is alien to local tradition, has never seen local Jews and has no memories about them. While in-depth research was conducted last year in Solotvyn and Nadvirna, efforts of the ethnography team this year were concentrated in Burshtyn. A dozen people living in the area adjacent to the Jewish cemetery were interviewed, especially concentrated on the street which before WWII was named after Theodor Herzl and now is named after Russian revolutionary and writer Alexander Herzen. The team also worked in Lysiets, where interesting information was recorded from the people living next to the Jewish cemetery and in Rozhniativ, where a descendant of local Jews was interviewed. The team also visited Kalush, Kolomea, Otynia, Chernelytsia, Verkhovina and Ternopol. During the 2010 field school, we used as a basis the questionnaire developed by the previous field school. This questionnaire, which in and of itself is an import result of the mission, will be improved using the experience of the current field school. During the collection of oral history, the recollections of shabes-goim (Christian children who were invited by Jews to light fire on Saturdays) were recorded in many places. Also, stories about Jewish holidays were recalled, including memories of Christians receiving matza from Jews and giving their neighbours Easter cakes in return. Several common stereotypes about Jews recorded last year were reconfirmed during this field school. The most widespread misconception is that Jews are buried in a sitting position. One explanation given by interviewees is the lack of space in the Jewish cemetery. Another one, no less "rational," relates that burial in a sitting position allows Jews to stand up quickly at the time of resurrection before the Last Judgment. Another widespread belief held by the local non-Jewish population involves a prikazanne - "commandment." Usually this relates to a mezuzah parchment, but it could also be a part of a Torah scroll, parchment from phylacteries or any text in Hebrew letters. Many magic rituals, especially in Ukrainian folk medicine, are connected to prikazanne. For example, the burning of prikazanne is said to help with epilepsy. During this field school we also often worked with local Jews, despite the fact that majority of these Jews came to the region after WWII from other areas. We were able to speak with communal leaders and document the current situation of the community. This information adds a significant layer to the findings gathered in the neighboring regions of Bukovina, Bessarabia and Podolia. In all these regions, it is customary that the Ukrainians come to Jewish people - to synagogues, cemeteries and even individual Jews - for help, considering that the Jewish religion is "closer to God." Evidence of such appeals is recorded by non-Jews as well as by Jews themselves. For example, Ukrainians come to a Jewish woman living in Rozhniativ - a rare case of a Jew in the village of today - and ask for Jewish texts for "commandments;" she even provides them with such texts from Israel. In the places where functioning synagogues exist, we documented an institutionalized practice whereby Ukrainians make donations to the synagogue in exchange for a prayer for their health and wellbeing. Due to the treatment of Jewish texts as a powerful magical aid, and the consideration of everything Jewish as a mighty power since "the Jews are first by God," the tradition of asking Jews for help has been preserved even after 65 years of Jews being generally absent from the region. A small team led by Dr. Vladimir Levin, of the Hebrew University of Jerusalem, continued its efforts from last year of surveying towns and villages where Jewish monuments remain. This year, the team visited those areas which were omitted last year due to lack of time. In the village of Bukachevtsy, a ruin of a synagogue and the area of a Jewish cemetery were found. The tombstones from the cemetery were used in the 1950s to pave the sidewalks. Since the inhabitants of the village do not need sidewalks along unpaved streets, they gradually removed these tombstones and threw them away. Chernelytsia village was once a thriving town with an important castle. 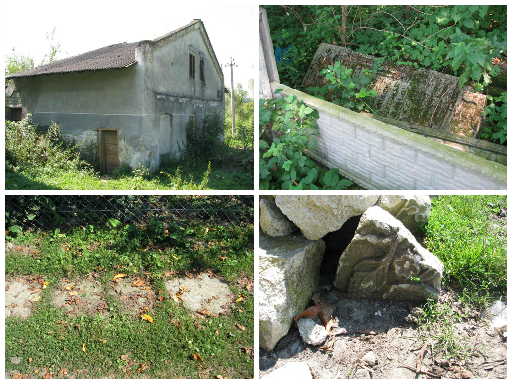 Today, only a ruin of a synagogue and remnants of several tombstones serve as reminders of its Jewish population. All Chernelytsia Jews were murdered near the village Mikhalche, where the Jews from Horodenka perished as well. The mass murder was performed on the banks of the Dniester River and today a youth resort stands in this picturesque setting. 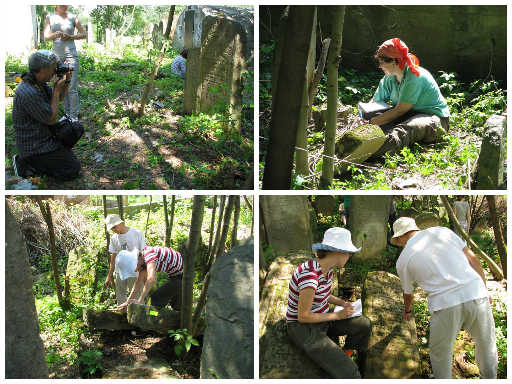 In Horodenka, the team visited the old Jewish cemetery with tombstones from the 17th and 18th century and found it surrounded by piles of garbage. In the quaint town of Sniatyn, the former synagogue was converted during Soviet times into a clothing factory. In one of the houses on the market square, the team was shown a hatch in a ceiling which served the Jewish inhabitants during the Sukkot holiday. The hatch was opened and the area under it served as a sukka. In Zabolotiv, the team found the Jewish cemetery situated between private homes and the building of the former beit midrash. In the town of Bibrka, which lies in the road from Ivano-Frankivsk to Lviv, the team photographed the ruins of the synagogue. The structure stood abandoned since the collapse of the Soviet Union and the closure of a food factory situated in this building. The team also visited the village of Verkhovina, formerly known as Zhabye. It is situated high in the Carpathian Mountains. A building which served as a prayer house is preserved there, as well as several Jewish houses in the vicinity. A small Jewish cemetery and a memorial sign at the site where the Verkhovina Jews were murdered are located in the village of Il'tsi. In the famous mountain spa of Vorokhta, the team discovered the Sanatorium of Jewish Academics - a health resort for Jewish students from Lviv, where treatment against tuberculosis was provided. It was built in the early 1930s by the Jewish architect from Lviv, Jósef Awin (1883-1942), in the International style. This elegant building is still used as a sanatorium and its architecture remains almost unchanged. The team was not able to visit the villages of Tatariv, Mikulychyn, Yaremche and the town of Deliatyn because the road was blocked by a heavy muddy flooding, which caused significant destruction. The field school offered an impressive educational program. Beyond instruction given during the documentation work, the students were offered educational trips and lectures. The first such educational trip journeyed east. The group visited Buchach (Buczacz) - the birthplace of Shmuel Yosef Agnon; Hrimailiv (Grzymalów) with its ruined synagogue from the 18th century; and Sataniv (Satanov), where an amazing Jewish cemetery and a synagogue from the early 17th century are preserved. 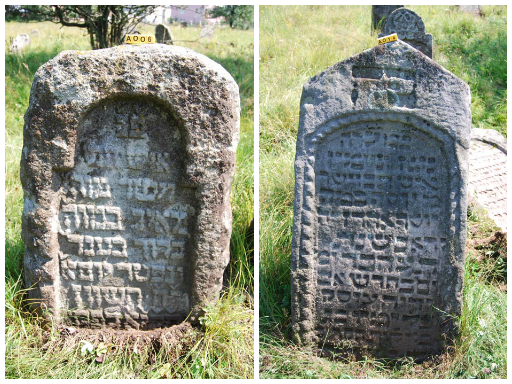 In Buchach, the group visited the 18th-century Jewish cemetery, now heavily used by local drug addicts and was shown Jewish tombstones found during the repair of a road in the town. The second educational trip ventured south to the Carpathian Mountains. The group visited the village of Kolochava with its 17thcentury wooden church and an ethnographic museum where a Jewish prayer room and a Jewish inn are reconstructed. Lectures by Dr. Khaimovich on Jewish history in Galicia in the Early Modern period and by Prof. Nosonovsky on Jewish tombstones were given at the ruins of the Buchach castle. Lectures by Dr. Levin on Moorish synagogues and by Dr. Khaimovich on synagogues' interior decorations were given in Ivano-Frankivsk. In addition, the ethnography group held evening seminars where the information gathered during the day was discussed under the guidance of Prof. Belova and Dr. Kaspina. For the past three years the Jewish Galicia and Bukovina project has been sending field schools to document and preserve Jewish remnants in Eastern Europe. This year's field school destination was Pidhaytsi, a quiet and pastoral town in Eastern-Galicia 62 miles South-West of Lviv. Its pastoral setting notwithstanding, Pidhaytsi was one of the more important and developed towns in the entire region. The name Pidhaytsi, which means "in the woods" is drawn from its location in the heart of the most forested area in today's Ternopil region in western Ukraine. Pidhaytsi is one of the oldest towns in Galicia with records as far back as 1463 when the Catholic Church was built by the regional Governor Potocki. During the Polish royal dominion Pidhaytsi was a major checkpoint on a main merchants' road from Snyatyn through Pidhaytsi to Lviv. Due to the many people passing through the town it was known for its fairs. The Jewish community of Pidhaytsi was one of the oldest communities in Galicia dating back to the 16th century. Towards the end of the 17th century many Jews of Pidhaytsi were killed by Turks and Tatars. According to the census of 1764 there were 1,765 Jews registered in the Kahal (the Jewish community board) of the Pidhaytsi district, of which 1079 lived in Pidhaytsi itself. In the 19th century the Jewish community grew rapidly and by 1910 there were 6000 Jews in Pidhaytsi constituting 60% of the population. In the interwar period the community decreased and by 1939, 3200 Jews remained in the town. Due to its location on the cross road between different cultures, Pidhaytsi became a fertile ground for mystical movements. In the case of the Jewish community the first such movement was the "messianic" Sabbatean movement and it caught the hearts of many Jews. The first Sabbatean to preach in Pidhaytsi was a known mystic figure by the name of, Chaim Malakh who stood in the head of a Jewish mystical group which came to Erez-Israel in 1700. The Hasidic movement was also very influential in the Pidhaytsi area. 5 well known Galician Hasidic Zaddiks lived in the Pidhaytsi area. The same can be said about Christian ascetics and hermits who found Pidhaytsi's surrounding appropriate for establishing monasteries, one of which is still active. Pidhaytsi was one of the most important Jewish communities in Galicia because of the notable rabbis that came from this town. The first rabbis of the town were Rabbi Moshe and his son Rabbi Yehuda Leib in the 16th century. The most famous rabbi to lead the community of Pidhaytsi was Rabbi Benjamin Aharon Solnik (1530-1620), known for his book "Masa't Benaymin"(Benjamin's Mess). Culturally the Jewish community was very diverse, much like the rest of Galician Jewry. In World War I the town was severely damaged and most of the town's homes were burnt. Many of the Jews of Pidhaytsi left the town that became the battle ground between the Austrian and Russian armies. When the town was occupied by the Nazi Germany in 1941 there were more than 3000 Jews in Pidhaytsi, some of which were refugees who came to the town in the first years of WWII. On Yom-Kippur 1942, 1000 Jews were sent to Belzec death camp. The rest were closed in a small ghetto where many died from hunger and disease. On June 6th, 1943 the remaining Jews in the ghetto were killed in mass graves in the outskirts of the town. The remaining of this once vibrant Jewish community are an old cemetery and an abandoned synagogue. In the summer of 2011 a group of 15 students made up of torah scholars from the "Siach Yitzhak" Yeshiva, students from the Ben-Gurion University and the Universities in St. Petersburg went out to document and research the remains of Jewish Pidhaytsi. The team was lead by Dr. Boris Khaimovich from the Hebrew University in Jerusalem and Ms. Marina Bruk from the State University in St. Petersburg. This combination of the torah and academic worlds created a unique atmosphere in the research group which suites the universal character of Jewish Galician culture. The main focus of the field school was the large and ancient Jewish cemetery. The team documented the entire cemetery which contains over 1500 tombstones (the oldest from the 16th century). The tombstones were numbered, photographed, measured and their epitaphs transcribed. Some of the tombstones were dug out of the ground and raised on their place. A detailed map of the cemetery was prepared by local land-surveyors. The field school to Pidhaytsi continues the remarkable, pioneering work of the 2009 and 2010 field schools in the pursuit after Jewish history in Galicia and Bukovina. The team was accompanied by an Israeli press team. The article can be seen here(in Hebrew). In the following weeks the materials gathered by the field school will be processed and presented to the public on the website.